IPL Royal Challengers Bangalore 2019 jersey links are placed here. The Royal Challengers Bangalore are one of the most supported and glamorous sides in the Indian Premier League. Led by Indian skipper Virat Kohli and boasting some of the biggest names in T20 cricket, the side is looking good for another strong season in the IPL. They launched new jerseys, manufactured by Zeven. Buy Royal Challengers Bangalore tickets 2019 here. How to buy Royal Challengers Bangalore jersey online? RCB have made a departure from their red and gold jerseys from the past. They will now sport new kits in black and red with a hint of gold thrown into the mix. 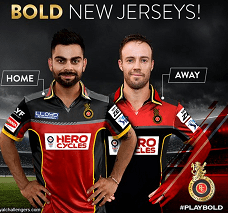 While the home jersey is majorly red in colour, the away RCB jersey is mostly black. Their merchandise is manufactured by Zeven and sold by Zevenworld, which is also the official website of the franchise. RCB merchandise is also available on the team’s official website. The Bangalore based side, which plays their home games at the Chinnaswamy stadium in Bangalore, has a range of merchandise on sale that includes home and away replica jerseys, training tops, caps, and fan t-shirts that come in both polo and crew neck. The fans also purchase their merchandise from fandomcricket.com/RCB. The replica team T-shirts for men and women are both available in all sizes. The replica home t-shirt is priced at INR 3290 while the away kit is available for INR 1790. The training top can be yours for INR 2390 while the crew and polo neck shirts are priced between INR 245 and INR 795. RCB caps cost INR 300 each on the website. Further, some of their merchandise is also available on Flipkart & Amazon ( Link 1, Link 2 ) where fans can grab the articles of their choice at discounted prices. Kohli and AB de Villiers are the star players who will don RCB’s colours for the new season. Although the side came really close to clinching the IPL trophy in 2017, they finished as losing finalists. They will look to give the tournament their best shot yet again come March 2019. They have one of the most wonderful set of fans that have supported them through the years with their home ground painted red in their team colours by the spectators. Although Bangalore has never lifted the trophy itself, they have come close many times and have always been a consistently high performer in the IPL. With the quality additions to the RCB roster in the player auction, the franchise and its fans will have high hopes for IPL 11. RCB 2019 jersey/shirt can be bought using the above links. Hi.i am huge fan of ABD so i need his jersy of this session of ipl.can i get it.